The final day of our trip began with an hour long drive across the desert to the Bawadi Mall in Al Ain, home to what is presently the only branch of Fun City in the United Arab Emirates with an operational full size roller coaster. Our trusty GPS gave up entirely when I asked it to route us from our overnight hotel, apparently due to a gap in the data provided by the people at OpenStreetMap, but it was able to point me in the right direction when switched to off-road mode and road signs did the rest. I found myself thinking back to a simpler time when trips were planned using physical maps; nowadays I travel with three electronic navigation aids, a laptop with Google Maps, and, if all else fails, a female to ask directions! We were given two laps on Spinning Coaster, and I can report that the ride quality was passable, if undistinguished. The only real negative was a nasty jolt on the airtime hill prior to the station, but we were able to brace for it the second time round which made things better. There was one oddity, however; Megan pointed out an exposed bolt in her seat that I'd failed to notice on my last visit. The bizarre decision to put something like this where it is bound to poke riders is a sad reflection on the engineering quality of SBF Rides coasters, though on the plus side the comfort level was still several orders of magnitude better than their rather diabolical Magic Mouse. 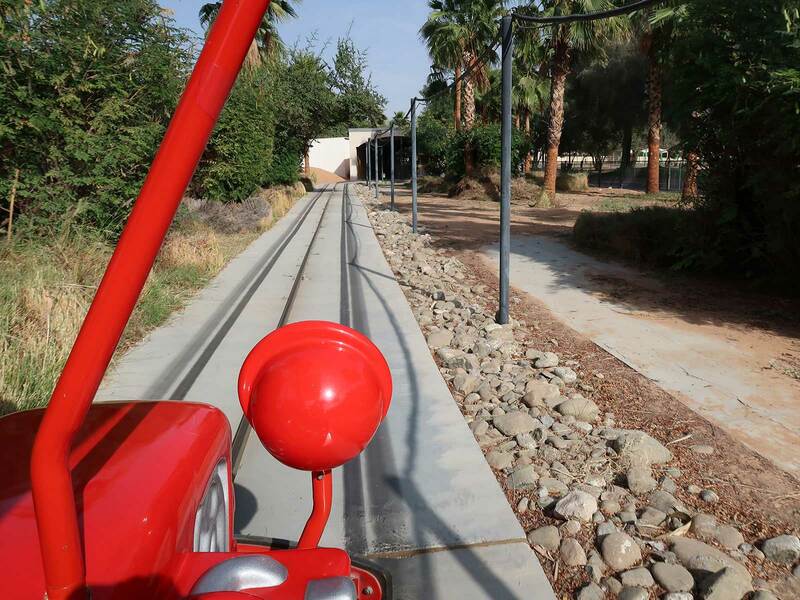 The driving time between Fun City Bawadi and Hili Fun City is theoretically around fifteen minutes, but that estimation assumes a crossing through neighbouring Oman. Doing that necessitates dealing with four consecutive customs checkpoints, and even if we'd developed masochistic tendencies we didn't have permission to take our rental car across a border. We decided to take the long route, and three quarters of an hour later the top levels of a bright orange Pinfari coaster came into view. The ride in question, Looping, opened with the park in 1985, though it was almost certainly a second hand machine originally produced for Swiss showman Paul Doesegger in 1982. It closed permanently at some point in the mid-noughties, and was abandoned a few years later when park management elected to consolidate their operations into the western side of their land bank; one presumes that the hardware was deemed uneconomical to move and refurbish. We drove around the outside of the park to see if there was a good photo angle available, but it soon became apparent that it was no longer possible to get close; the best we could do was from within the park, pictured below. We parked our car in front of the new entrance, bought tickets, and headed to Twister Mountain, an eight year old compact spinning mouse ride from Zamperla with signage and lighting cloned from its namesake at Leolandia. The track was overdue some fresh paint, and the chain lift engagement was rather violent, but aside from that the ride was pretty much as expected. We enjoyed a reasonable amount of spinning aided considerably by the fact that the two of us sat on the same side of the car. Megan made a special point of not using the dedicated queue for ladies, and she wasn't alone in her resistance; though there were only a handful of people in the park today everyone we saw regardless of gender was using the family queues. Our second stop was at Hili Mouse, an Interpark Tropical Track that barely merited a single sentence in my trip report back in 2010. Much to our surprise this turned out to be brilliant, with two extreme moments of lateral force that were as unexpected as they were improbable. The first came at the apex of the hill immediately after the descending helix, where I was unceremoniously thrown from one side of the car to the other. The second was on the final turn into the station, which was similarly wild. I've no recollection of the same happening at Happyland New, suggesting that the engineers responsible for maintaining this machine know their business. We ended up riding four times over the course of the afternoon, which was three more laps than we bothered with on the bigger coaster. With no shortage of time we found our way to the mislabelled 3D Action Cinema, a decidedly two-dimensional Dynamic Motion Theatre installed by Intamin in 1991. The hardware moving the various seats was exposed in plain sight unlike the more modern equivalents; it occurred to me subsequently that it might be fun to stand somewhere else in the auditorium while the show was running to watch the various seats in motion. The movie, presumably unchanged from when the attraction first premiered, was a hilariously bad show tracking a series of redneck Americans as they raced pick-up trucks over uneven terrain. We also called into Sindbad's Farm, an antique cars ride from SBF Rides using the same sound hardware that we mercilessly mocked at Energylandia last year. The button in our car played a bleeped arrangement of "Under the Sea" from Disney's The Little Mermaid, albeit only about twenty seconds of it that stopped right in the middle of the recapitulation. The route took us past a series of static models of animals with wide grins on their faces and a set of jars labelled "camel milk". 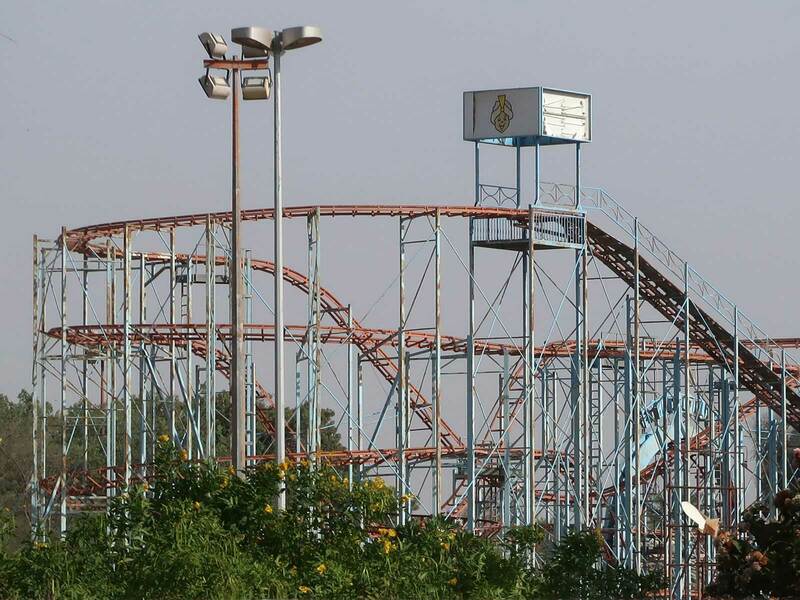 This park was known as Sega Republic at the time of this visit. 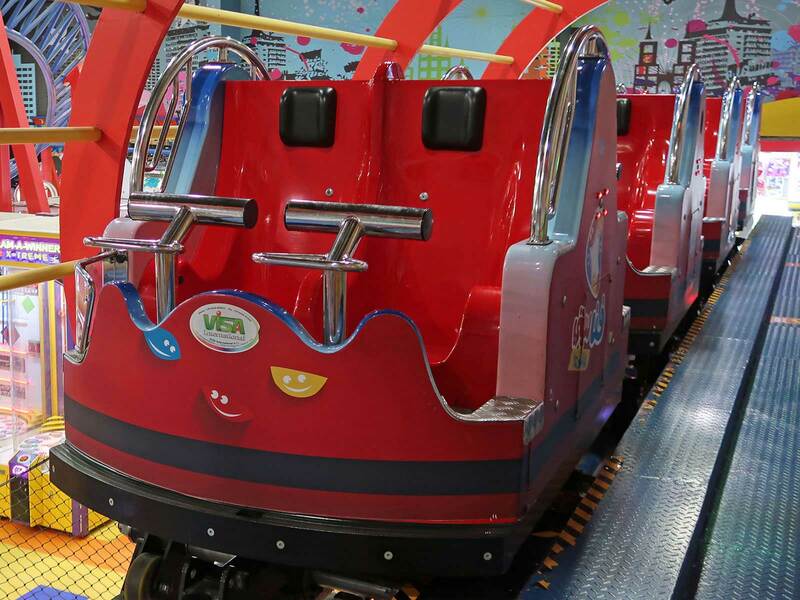 Sega Republic is located in the Dubai Mall, the largest shopping mall in the world by total area. The place was extremely crowded for our visit; it took us over half an hour to find a parking space within the enormous multi-storey lot, and we had to scrap our plan to visit the nearby Burj Khalifa when it became apparent that there was a four hour wait for walk-up visitors. With the benefit of hindsight it was a mistake to schedule a trip for a weekend; next time we'll be more careful. There was a mandatory locker policy in place on Spin Gear, but the lockers were in the station area and included in the 30 AED ride fee so we didn't mind too much. The ride begins with a lift hill in the dark, followed by the only section of track visible from the midway, namely a short drop and some wild mouse style switchbacks. The rest of the track is an enclosed collection of turns punctuated by the occasional helix. The layout had potential and would likely have been great if the cars had spun the way they were supposed to. Unfortunately the only place we experienced any rotation was on the brake run, making the whole experience anticlimactic.